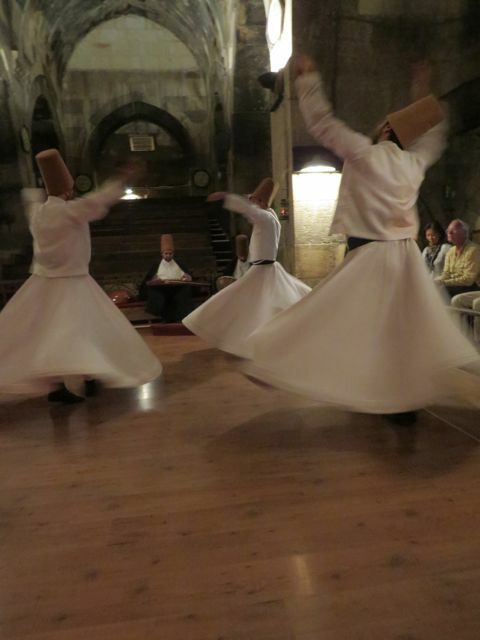 Now about the Whirling Dervishes: This is how I remember the explanation before we went to the performance: It takes at least a thousand and one days for a dervish to learn how to whirl. 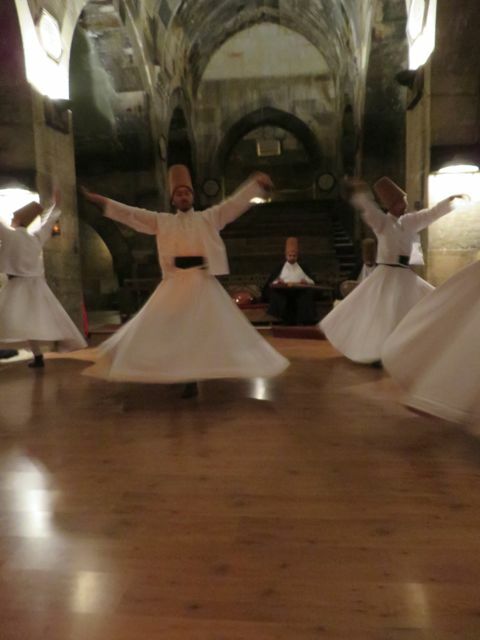 Mevlana Celaleddin Rumi is credited with developing the philosophy of the twirling to gain piety and perfection. The performance begins with the prophet representing love and then followed by the sound of ancient instruments. The next ritual is that each participant bows and greets each in the group. Several other rituals are performed. Then, the black robes covering white dervish costumes are dropped and the twirling begins. We had front row seats and you were wrapped in the cool swirling air of the event. The performance ends with the reciting of the seven advices of Mevlana. We enjoyed the performance in the evening. 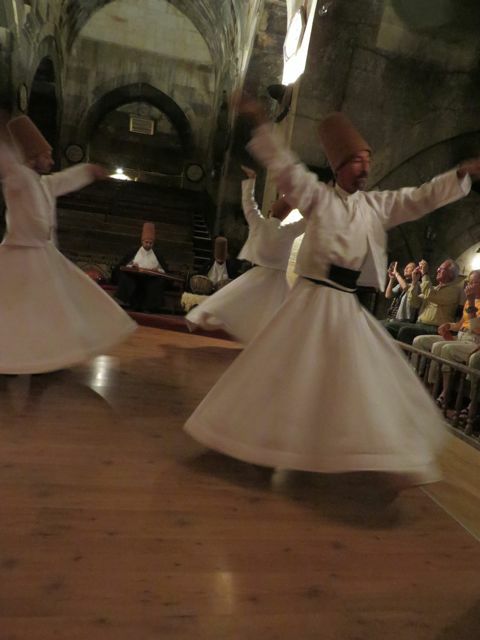 Our show lasted 45 minutes, but accomplished dervishes can twirl for hours. 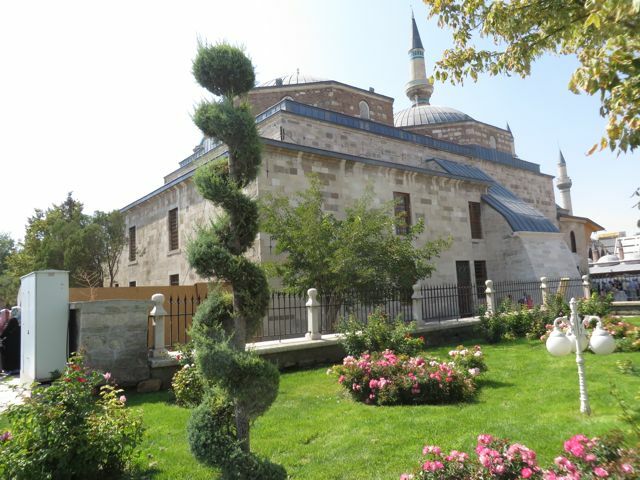 The next day we drove to Konya and were treated to a visit of the Tomb of Mevlana in Konya. The tomb and shrine of Mevlana, the founder of the Mevlevi Order of Whirling Dervishes and is a pilgrimage for people from all over the world. 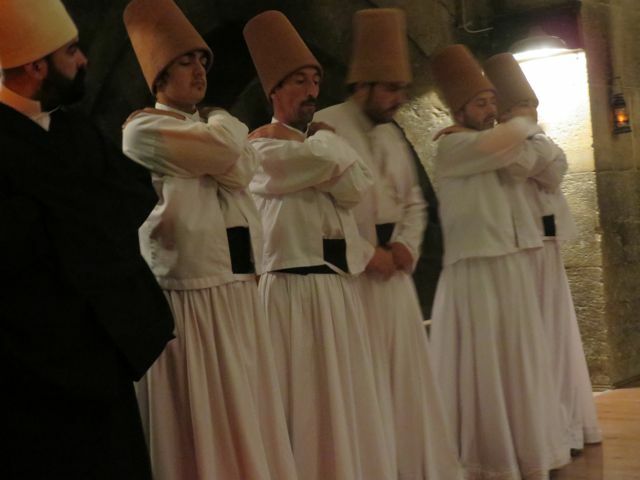 The tomb has also been converted into a museum, which has items that belonged to Mevlana and other dervishes. Here is where I saw the full breadth of Faith in physical human actions. The visitors could not get close enough to the encased items. They touched the glass gently with their hands and faces, desperately trying to get a smell from a slight open space in the glass. We moved along with the crowd and did as they did. This site is revered by so many and is as crowded everyday as it was when we visited. The tomb and shrine of Mevlana. 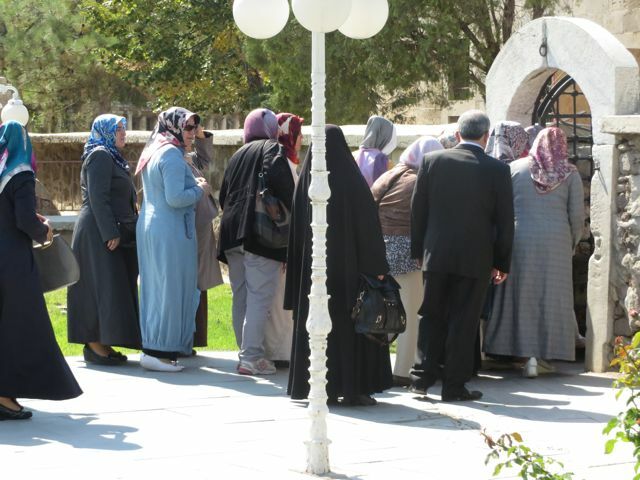 Visitors coming to the shrine.